Bread Pakoda makes for a delicious evening snack. Bread pakodas are quite a celebrated Indian street snack. Soft bread stuffed with spicy potato filling, rolled into a gram flour batter and then deep fried until crisp. It is a tasty combination of different textures. 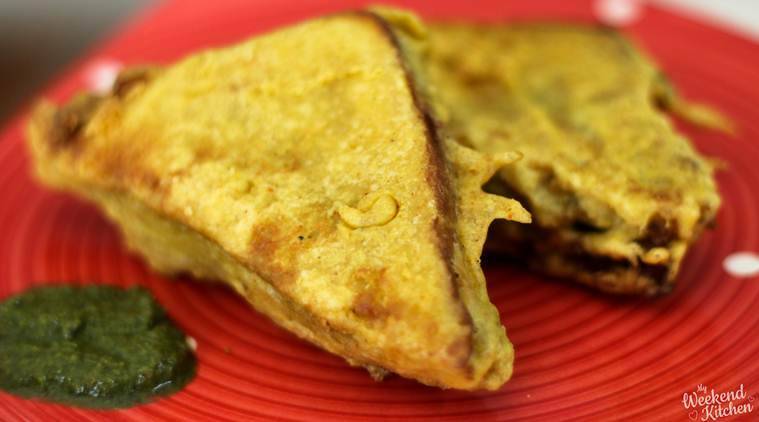 This bread pakoda recipe is a trip down memory lane of sibling love and fights. And this week seems perfect to share it. My sister and I love bread pakodas and as kids would often take them to school in our lunch boxes with little boxes of homemade ketchup. Mom used to find ways to make everything healthier. We always had whole wheat brown bread instead of white. While on the streets, bread pakodas are made with a potato only stuffing, she used to make a mixed vegetable stuffing with peas and carrots and sweet potatoes when they were in season. The stuffing for bread pakoda is just a mixture of boiled vegetables and not cooked, but you can also use leftover potato bhaji or stuffing as that for Stuffed capsicum. Instead of serving on the side, I like to spread green chutney and ketchup on the inside of the bread pakoda. It makes them easier to pack as well as for travel and picnics! * In a mixing bowl, mash together potatoes and other boiled vegetables along with the spice. I simply use the back of a fork to mash and mix. We want them stuffing to be a bit chunky and not very smooth. * In another bowl, add gram flour, salt, and oil. Slowly add in the water to make a thick batter. * Cut the bread slices into half triangles. You may remove the edges if you want, but I let them be. I actually like the crispy edges. * Heat oil for deep frying. * Take two half triangle, spread green chutney on the inside of one and ketchup on the other. Fill about 2 tbsp of stuffing between two bread triangles, close to make a sandwich. Prepare all the sandwiches before you start frying. * Now dunk this sandwich into the gram flour batter and straight into hot oil. Deep fry until golden brown on both sides.